The 200-WS-25 Wind Logger with Real-Time Display is designed to provide an affordable and easy-to-use solution to monitor wind speed and direction data. 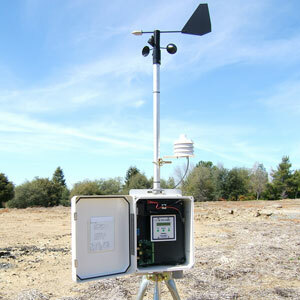 It records wind speed, gust, wind direction, time and date, and battery voltage. The wind logger records directly to a Secure Digital (SD™) card up to 2GB. No special computer interface cables are required. A new file is created and saved to the card for each day the logger is in use. Data is stored in a text file in Comma Separated Value (CSV) format and can easily be viewed and analyzed using standard spreadsheet software. Using the recorded data is simple. The SD card is inserted into a card reader attached to the USB port on your computer (Windows, Macintosh, or Linux) and will then show up as a drive. To view and graph the data, click on the spreadsheet corresponding to the day of interest. Microsoft Excel, OpenOffice.org, or many other spreadsheet programs can be used to view, graph, and analyze your wind data. Easy set-up with the three front panel buttons, no computer required. LCD Display: Screen displays current information and is used for configuring the data logger. Simple menu-driven interface makes setup easy. A bright backlight makes the logger easy to use at night. Clock: An accurate real-time clock is used to time-stamp each measurement, accurate to within 10 minutes per year. Logging: The data logger supports Secure Digital or Multi Media Card 128 megabytes up to 2 gigabytes. Communications: An available RS232 serial port is a feature of every wind logger.